Grit & Perseverance - Voluntary goal oriented behaviour, despite obstacles, disappointments, difficulties and discouragements.The ability to continue taking the right actions that lead us towards our goals despite setbacks and brickbats. This trait falls within the sphere of Courage. Some of the ways to develop this trait is to have a role model and mentor who can guide either in person or in spirit. This trait can also be developed by setting small simple weekly goals and achieving them on a regular basis. This particular value/trait is ranked highest amongst all traits to possess and is associated with delayed gratification in its ability to predict success. King Bruce and the Spider is a classic legend set in medieval Scotland that brings out this value to perfection. Mathematician Andrew Wiles had a 30 year obsession with Fermats Last theoram and spent 7 relentless years to finally arrive at a solution. Grit; Plays a major role in shaping people's life! A very long time ago, there flowed a yellow river on earth and from where it met the horizon, flowed a blue river to the sky. The two were separated by the Dragon Gate and what lay yonder on the blue river was the magical Great Waterfall. Every fish in the river dreams of swimming through the yellow river and reaching the other side. But this was an arduous task, for the water flowed upstream and many fish gave up even before they started. ...Except for one little fish called Blue Koi, who lived in the yellow river along with his gorgeous and elegant Father Black Koi and Mother Red Koi. This little remarkably deep Blue Koi had a heart of its own. He wished to swim upstream and reach the Great Waterfall, for he had heard from his Father that all those who could get to the other side would grow wings and become transformed into a Dragon Fish. So he dreamed of becoming one. The current was strong when Blue Koi started flapping his fins. He flapped and flapped and pushed himself as much as possible. Gradually he progressed up the river towards his goal. Yet his loud flapping attracted the Gods who were guardians of the blue river. They peered down from the skies to see this iridescent Koi swimming with such focus. They did not like it one bit. They did not want any more newcomers to their river and definitely not such a small Koi fish. They clapped their hands and suddenly the River Mouth Monster emerged from the deepest part of the yellow river and stood ready with his mouth open for he could swallow anything that crossed its path. The Blue Koi was taken unawares and found himself dragged into the deep cavernous mouth of the river monster. But he was alert and watchful and that is how he noticed the tiny holes on the skin of the River Mouth Monster, just big enough for him to squeeze through and with renewed effort, he bravely swam through the tiny pore and escaped from the hurdle placed in front of him. Again he flapped and flapped and pushed as much as possible. Now the Gods were eager to test him once more, so with a swish of their hands they churned the yellow river so badly that Blue Koi could see nothing. Dirt and dredge floated around him and he flapped helplessly trying to see ahead. He waited patiently for the dirt to settle down, which it did after a long while and then once again Blue Koi resumed his flapping. Some would say that the Wind God was impressed by him and sent a gentle and calming breeze to settle the water, while some say the Blue Koi Fish was himself so patient that finally the river did settle down. Yet again he kept flapping and flapping as much as possible. Now Blue Koi could feel a different tension on his fins, he knew he was nearing the Dragon Gate, the water was flowing very differently. Bump! His head touched something hard and the water too had reduced to a thin trickle. He looked around and noticed there was yet again another hurdle in his way. A huge wall stood in front of him and beyond that he could hear the gurgling and gushing of the Great Waterfall. “I am almost there, except that I have to cross this wall. How can I do this?” both excited and exhausted at the same time, Blue Koi muttered. The Gods had created a huge wall in front of the Dragon Gate and the Blue Koi had only one way to cross this hurdle. He had to JUMP, even though he was tired and exhausted. He had to make this final effort. Taking a deep breath (in fish that would be flapping harder), Blue Koi jumped as high as he could. He only splashed back into the water. Again and again he jumped and then jumped yet again. The Gods laughed, but he was relentless. Every time he fell down, he flapped his fins and jumped right back. This went on for very long. Finally the Gods who till now were testing him, feeling great admiration for him, quickly summoned the River God to create a huge wave that carried little Koi right up and over the wall and through the Dragon Gate. He had made it with a lot of effort and whole lot of perseverance! The Blue Koi looked at himself and realised that as he crossed the Golden Gate he had been transformed. Elegant paper thin, colourful wings now adorned his two sides and he had become a true Dragon Fish. He floated in that calm water with abandon. 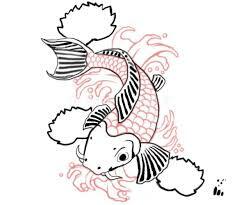 Though he would remain a Blue Koi in his heart, he could always become a Dragon Fish whenever he wanted. Through sheer, hardwork, perseverance and focus, the little Blue Koi had become a Dragon Fish.